After unveiling their new smart outdoor security camera earlier this year Netatmo have now launched their new Netatmo Presence making it available to purchase priced at $300. The camera offers a resolution of up to 1920 x 1080 pixels and is fitted with a 4 megapixel video sensor and a 12Watt dimmable spotlight, with detection technology that can see up to 15m or 50ft. The new smart outdoor security camera is capable of detecting the presence of a person car or animal and reports the detection in real time if someone is outside home, a car pulls up on your driveway or your pet is detected in your yard. Watch the video below to learn more about its installation and smart features. The official website explains a little more about the Netatmo Presence outdoor security camera. Netatmo Presence detects and reports in real-time if someone loiters around your home, a car enters your driveway or your pet is in the yard. Ultra-precise alerts let you know instantly about what happens outside your home. Use live stream to view your property in real-time. At night, either watch discreetly with Presence’s infra-red night vision or switch the camera’s floodlight on. The smart floodlight can be switched on manually in the app or set to switch on when it detects a person, car or animal – or for all three. It helps you find your way safely at night and deters any unwanted visitors. Presence simply replaces any existing outdoor light fixture. 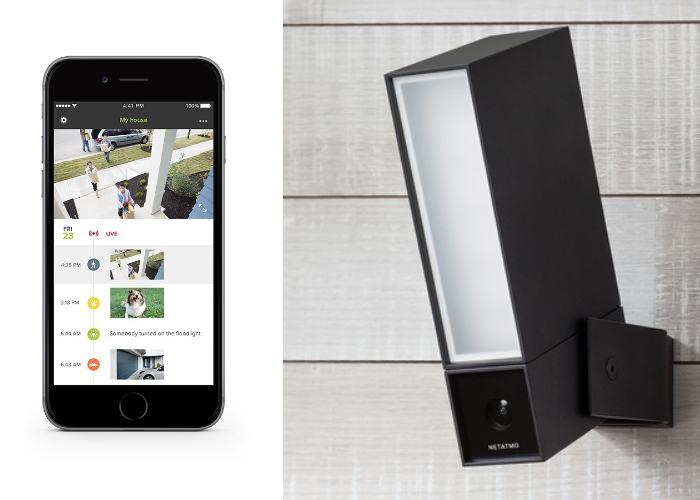 For more information on the new Netatmo Presence outdoor security camera jump over to the official website for details by following the link below.